You don't have to go far in Calgary to find a great hiking trail. Natural areas abound in our city. Below are my family's favourite places to explore close to home. You'll notice that most of the hikes are located in the NW or SW part of the city but that's the area of the city I'm familiar with and I can't justify driving across the whole city to reach Fish Creek Park when I can get to Canmore in the same amount of time. Please check the Resource Section at the bottom of this page for great hikes in other parts of Calgary. I usually park at John Laurie Blvd and Brisebois Drive if I want a good hill workout. There are many options from this parking lot from paved trails to more natural pathways. I take our Chariot with me and often push my son up (for my exercise), let him out (for his exercise) and do a loop of mostly natural trails. There is an excellent paved trail though that takes you all the way up to the top of the hill. From there you can walk towards Shaganappi and come back the same way, never leaving pavement. Since my family loves hiking, we create new loops each time we go up and rarely touch the paved paths. 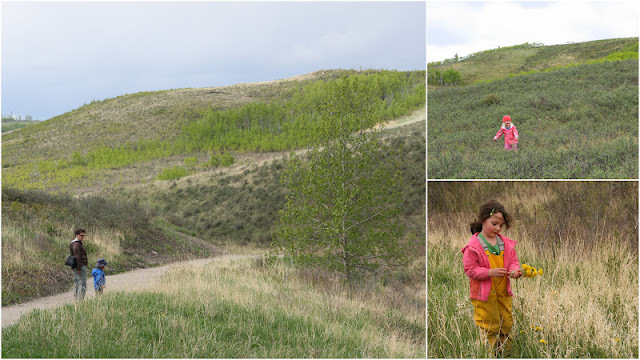 If you haven't explored Nose Hill much, head North when you get on top of the hill to reach the quarry, an interesting place with a small pond and rocks for throwing. This is a stunning place to visit in the fall. If I want an easier workout or just a change of scenery, I park at Shaganappi and Edgemont Blvd. It's mostly flat walking on either paved trails or natural paths from this entrance. If you explore in the trees you'll find a large tepee within a kilometre of the parking lot. Kids will have a great time checking it out. I put these two parks together because we often combine them on our hikes. To access Bowness Park, head to the neighborhood of Bowness and park in one of the many official parking lots at 8900 48 Ave. NW. 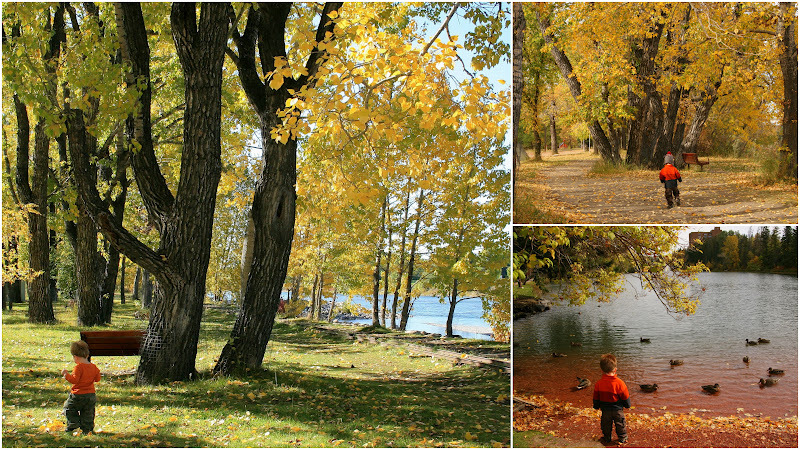 Bowness Park features a lagoon (great for watching ducks and geese), picnic areas with fire pits (several can be reserved in advance), playgrounds, paddle boat rentals in the summer, green fields for playing sports and a cafe. Redevelopment is currently going on so expect construction and detours within the park. On the bright side, it's a good place to watch diggers at work. In the winter, this is one of the best places in Calgary to go outdoor skating and there's no cost to use the large lagoon. There are natural walking paths around the park but no paved paths. Bring an outdoor stroller with good wheels if you plan to use one down there. 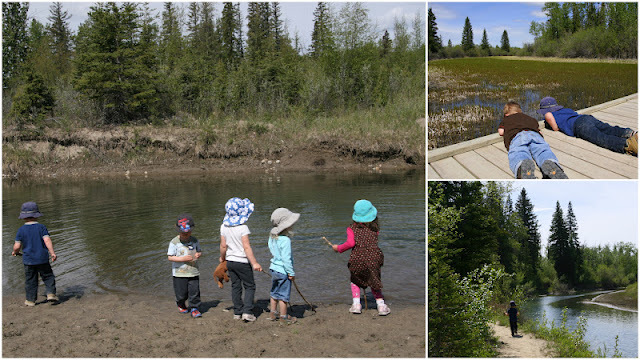 There is access to the Bow River so children can throw rocks in the water. Baker Park is located on the other side of the Bow River from Bowness Park. (9333 Scenic Bow Rd.NW) Though there is parking, we always walk from Bowness Park to Baker Park on a scenic paved trail that follows the river. There's a central area with a grass amphitheater popular for weddings and summer concerts. The amphitheater has many short paved trails going through it and I've seen kids wheeling around on their balance bikes. 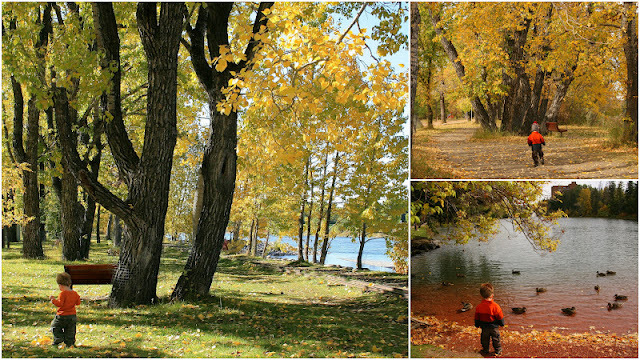 One - Do a loop of Bowness Park on natural trails, take some time to throw rocks in the river, walk along the creek that flows into the lagoon, visit a playground and even have a picnic. Two - Follow the creek from the lagoon at Bowness Park on a natural trail until you reach the pedestrian bridge under Stony Trail. Cross the Bow River to access a paved trail that will take you over to Baker Park. Pass by Baker Park and head towards the 85th Street bridge. Cross the bridge and head back to Bowness Park. The loop is approximately 3km. Three - Follow the creek from the lagoon at Bowness Park on a natural trail until you reach the pedestrian bridge under Stony Trail. Do not cross the bridge. Instead look for a beautiful forest trail following the river through a Douglas Fir Forest. The trail goes below the community of Valley Ridge. It's possible to take stairs at the end of the short trail up to Valley Ridge and come back along a paved trail, down a gigantic paved hill with switch-backs, and end up at your starting point. There are lots of stairs on the forest trail so do not plan to bring a stroller or bike. The trail out and back or as a loop would not be longer than 3km. Bowmont Park is one of the premier natural areas in the city. We often access it from Bowness Park to create longer walking loops. You can also access the park from the community of Silver Springs at the end of Silver Springs Blvd (past the shopping plaza with Only Women's Fitness). The park has paved and natural trails, off leash areas, creeks, bridges, train bridges with passing trains in the morning and evening, and boardwalks. There's even a waterfall by the Bow River. Many of the natural trails follow high up on an escarpment over the river. From Bowness Park, head east on either paved or natural trails to access Bowmont Park. The more you explore the area, the more you'll discover new and wonderful trails. We have our favourites and you'll find yours too. Check out the city pathway map as a starting point. Lori Beattie's book, Calgary's Best Hikes and Walks has three detailed loops that cover the Bowmont, Bowness, Baker Park area. Alternately, start in Silver Springs and you'll be right at the trail head for Waterfall Valley. This is a lovely trail that uses stairs and boardwalks to access the Bow River and a lovely waterfall down by the river. It's our favourite trail in Bowmont. From the end of Silver Springs Blvd, get on the paved trail and head west a short distance until you see the sign for Waterfall Valley. Down and up is not more than a kilometre but you can combine the valley with a larger hike on natural trails out to a viewing platform over the river and train bridges (further west) and come back along the paved trail to your car. This is one of our favourite natural areas in the city to explore. There are many access points in the community of Tuscany but the easiest place to park is at Tuscany Blvd and Tuscany Hills Way (street parking). Look at the map on the city's website to find a good place to get onto the paved pathway that follows the ravine. From the pathway, there are access points to get into the ravine. One is right off Tuscany Blvd just before you come to the Tuscany Club so you could park in the Club's parking lot. The highlight of the ravine for families is the creek that runs through it. 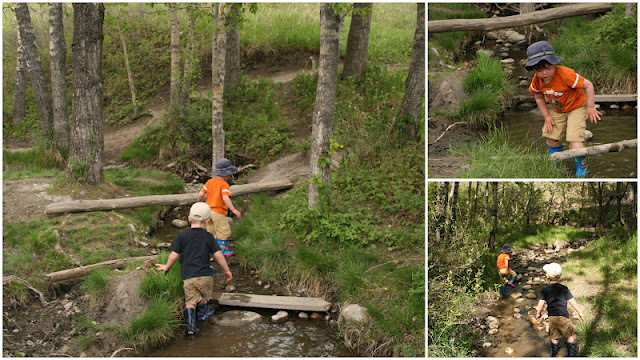 I've taken children down into the coulee and it's always an adventure trying to cross the creek on logs, stones, and home-made wooden bridges. Wear rubber boots or water shoes if you really want to do some serious exploring down there. We've also found teepees down in the coulee which are fun for kids to play in. This is one of the best multi-use parks in Calgary. There's picnic areas with fire pits, playgrounds, paved trails for biking, natural trails for hiking, serious hills for training and conditioning, a dog park, and for train lovers - railway tracks running right through the park. Come in the morning and you'll see trains pass by every half hour. 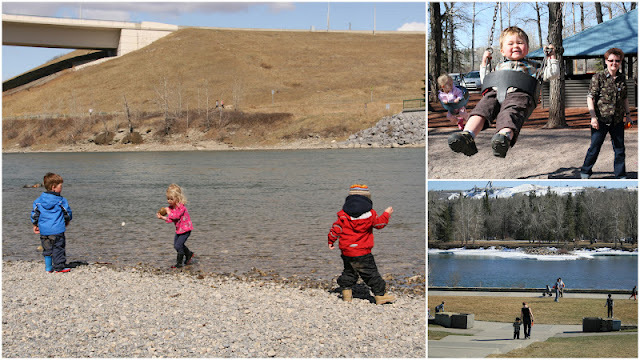 The park is also located on the Bow River so you can spend a lot of time throwing rocks in the river - always a hit with kids! There's two main hikes in this park that we love to do. The most popular hike is the Douglas Fir Trail. This is an excellent spring conditioning hike with several flights of stairs leading up to a scenic viewpoint over the Bow River. It'll get your heart pounding and my son finds this trail incredibly interesting. Maybe it's the challenge of climbing all the stairs. It's a beautiful hike through a huge grove of Douglas Fir trees - hence the name, some as old as 500 years. The half loop is under 4km but younger children may need to be carried a bit. Otherwise, you can just go to the viewpoint and return the same way. There and back to the top of the escarpment would be 2km at most. Note that the trail is closed in winter due to natural springs that create ice flows along the path. To find the Douglas Fir Trail, cross the train tracks to the South Parking Lot and get on the official paved bike trail. Head East on the South side of the tracks. Within 5 minutes you will find the official sign for the trail and it's easy to follow from this point. You'll first climb to an escarpment (lots of stairs so don't bring a stroller) and then make your way back down to the paved bike trail again. This is the short loop where you can follow the bike trail back to Edworthy Park. If you continued all the way to Crowchild Trail, you'd still come back on the bike trail but it would be at least a 7km hike. The other hike we love to do is a bit more complicated for directions as it isn't an official hike. I call this the Dog park hike (don't do it if you're afraid of dogs). From Edworthy Park, cross the train tracks to the South Parking Lot. The paved trail goes East here towards the Douglas Fir Trail. You want to go straight. Up the gigantic monster hill in front of you. It's not paved and it looks terrifyingly big. Don't be afraid though. I took a group of preschoolers up there and every one of them made it. (including the moms carrying younger kids). Note that you will be on the west side of the paved road entering the park from Bow Trail. There is another hill on the left side of the road too (also fun) but it will put you on the wrong side of the escarpment to finish the loop. Once you are on top of the escarpment take some time to breath, enjoy the flower meadows, let your dog run free in the off leash area, and then start walking west along the top of the escarpment. There are several ways down off the escarpment, some steeper than others. Basically keep walking west until you find a good trail going down at a pair of benches. There will be steps on the path and it isn't too steep. You'll come out along the train tracks and can follow them back to the main park. If I've completely confused you, pick up a copy of Lori Beattie's book, Calgary's Best Hikes and Walks from any Calgary book store. (Even the library carries it) She describes this Edworthy Hike in great detail. 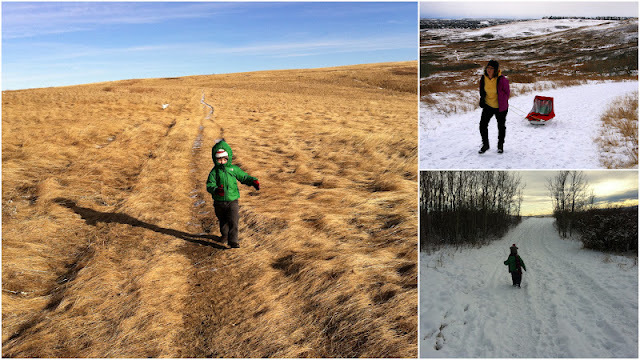 The total distance of this hike would be less than 4km because my 3 year old can do the whole thing on his own. 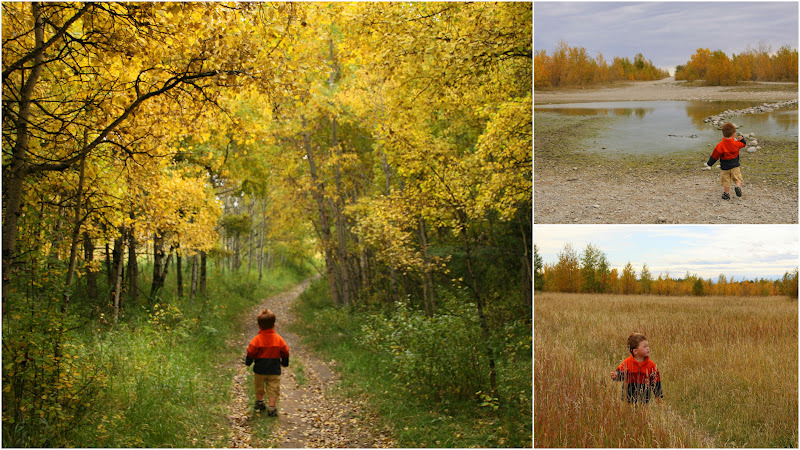 The Weaselhead Flats natural environment park connects North and South Glenmore Parks. It's located at 66 Ave. and 37 St. SW and has its own parking lot labeled Weaselhead. It's one of our favourite hikes in Calgary and once you start hiking through the flats, you'd never know you were in the city. It makes a great destination for a real hike within the city limits. From the parking lot, take the paved trail down the long steep hill. At the bottom, you'll cross the west end of the Glenmore Reservoir on a big bridge guaranteed to thrill kids. A short distance after the bridge you'll see the sign for the Weaselhead Flats Natural Area. 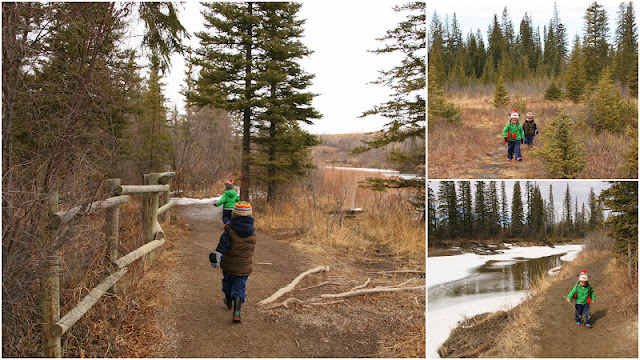 Follow the meandering trail that follows the Elbow River until you get to an intersection of several trails. The one heading left will take you back to the beginning of your hike and is your shortest choice. Take either of the other trails for a longer hike. The one going right takes you to a boardwalk section that's seriously cool. If you took the shortest path to create a loop through the flats, it would be around a 3km hike. Expect slightly longer distances if you choose one of the other trails. Note that with the longer options you will be hiking back along the paved bike path. 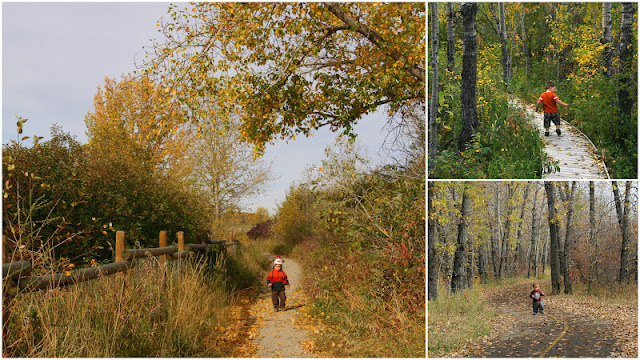 This is a popular trail amongst trail runners in Calgary and it should be on your family's hiking list as well. It's a fun hike for children because unlike most hiking trails, you don't have to slowly plod uphill for endless amounts of time just to turn around and head back down. This trail goes up and down, up and down, and then up some more - followed by down some more. It's a great work-out for runners but even more so for kids who will also run each of those short hills. I like to do this trail as a Chariot hike for great exercise (It's not paved but is smooth enough for off-trail Chariot running) and I also like it with groups of small children who can have fun chasing each other up and down each hill. To find the trail head, take 14th Street South to 90th Ave. Turn Right (West) and continue past the first sign for South Glenmore Park. Turn at the second sign that says "Weaselhead Parking Lot." Follow the paved access trail a short distance to a T-intersection. If you were to go right, you'd end up at the official parking area for South Glenmore Park. Go Left instead. Almost immediately, you should see a natural trail taking off from the paved path (there should be a sign as well that mentions the Weaselhead area). The path will be to your right and will be down by the reservoir. 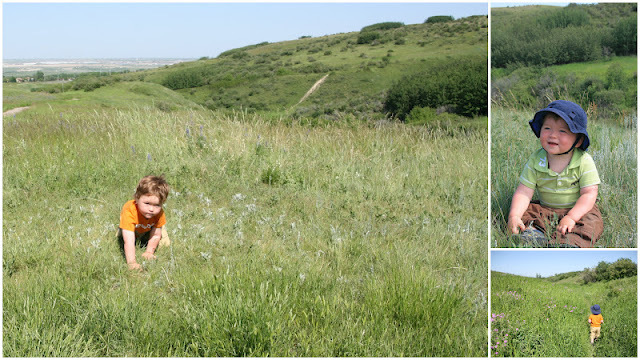 Head down to the natural area and voila, you are on the Jack Rabbit Trail. Follow the trail for as long as you want before turning back. There are many escape routes to your left that will head back up to the paved trail. Otherwise, you can continue until you get to a big wide clearing and four way intersection. (approx. 3km return) Left would take you back to the paved trail you started on. Continuing straight or going right would take you towards North Glenmore Park (and a long walk back.) We like to turn around and follow our same path back. 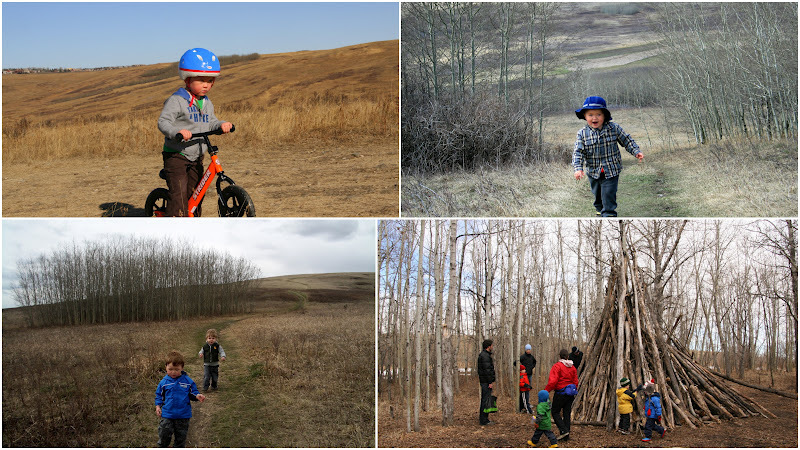 Griffith Woods is a secret to most Calgarians not living in the community of Discovery Ridge. Located at the edge of the city as you take Hwy 8 out to Bragg Creek, it is a natural environment park that winds its way along the banks of the Elbow River. I found out about the Park when I was working for the City and it's truly one of Calgary's best natural treasures. There is an official parking lot with bathrooms located at Discovery Ridge Cove SW (look it up on Google Maps before you go because it's tricky to find the first time.) From the parking lot you can either take paved trails heading West or East but the longest walk will be in the West direction. If you go East, you'll end up at a small lagoon where the trail soon ends. You can take the relatively flat paved paths if you have a stroller or child learning to ride a bicycle. With no hills in the park, it's actually a great place to practice riding a bike. If you are looking for a more natural experience, follow the gravel paths to find hidden bridges and even a small swimming hole. There's great signage in the park so you don't have to worry about getting lost. End to end, the trail that runs through Griffith Woods is only 7km return so it's not a big park. Visit a few times and you'll quickly discover your family's favourite spots. Glenbow Ranch is located on the North Shore of the Bow River between Calgary and Cochrane. While not exactly a hike within the city limits, it is definitely closer for those in North West Calgary than Fish Creek Provincial Park would be. To fully appreciate the park you will have to hike down towards the river which means descending a large hill and climbing it again to reach your car. There are no hikes in this park that get around this hill unfortunately. Were the park located at valley bottom, you'd be able to enjoy a flat leisurely walk. Many of the trails are paved but there are plenty of natural options as well. The Tiger Lilly Loop is our family favourite. For more information, stop in at the Visitor Centre located beside the parking lot. Park Staff are always happy to answer questions, bring out a map, and tell you about the park's fascinating ranching history. While not exactly within the city limits, this provincial park is only a half hour drive or so from the NW edge of Calgary and is 20 minutes from Cochrane. For those of us in the north part of the city, it's closer than Fish Creek in the south. Therefore it needs to be included in this list of awesome family hikes in (and near) Calgary. The special thing about this park is that it features a large spring and several small waterfalls that flow year-round. Children will have fun playing in the ponds, waterfall pools, and creek flowing through the area so make sure you bring rubber boots. While there are no fire pits here, there are a few picnic tables at the base of the spring so you can set up camp here for a few hours while the kids run up and down the trail past the various pools. There is a loop hike of about 3km approximately that takes your through a forest en route to the spring at the bottom. The City of Calgary's pathways and bikeways map, available as a print or electronic copy. There's also an interactive online version and an I-phone app. Thanks Lala. I have a lot of work to do on getting more hikes up here. So many favourites. What a great list! We do 12-Mile Coulee, Bowness and Bowmont regularly, but I'm looking forward to trying out ones in the SW too. Thanks Erin. You'll love Griffith Woods. Awesome Andrew. Thanks! Maybe we'll go try it today. I like to preview things before I drag a bunch of other families out. We'll bring micro spikes and Noah's snowshoes. Somebody really has to make cleats for kids! I think we'll try Griffith Woods tomorrow, hoping for snowy paths so we can use the sled! Thank you for another wonderful suggestion, Tanya. We spent this morning at Griffith Woods, which is only 15 minutes from our home, and wow, was it ever lovely! Glad you liked Griffith Woods. It's an excellent place. Great resource! The time and effort to put this together is much appreciated! Looks like you've got a very active life style and hopefully will encourage other families to follow suit (myself first of all!). 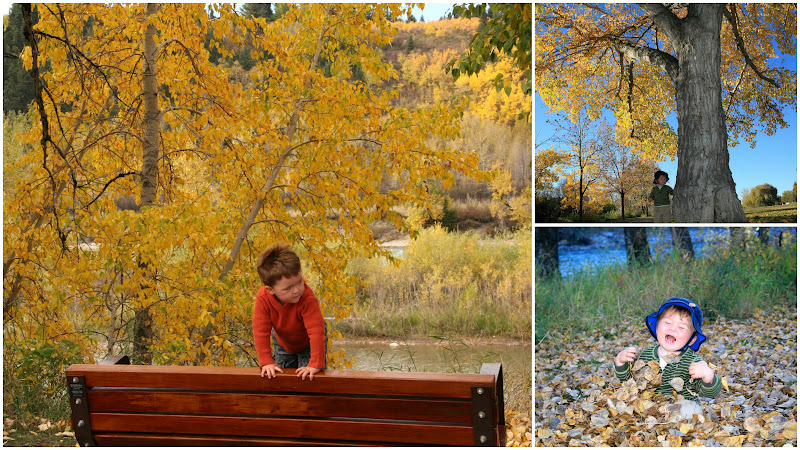 Love the different seasons pics. This blog is perfect, we are here on holiday from amsterdam with our two sons, nearly 2 and nearly 4. 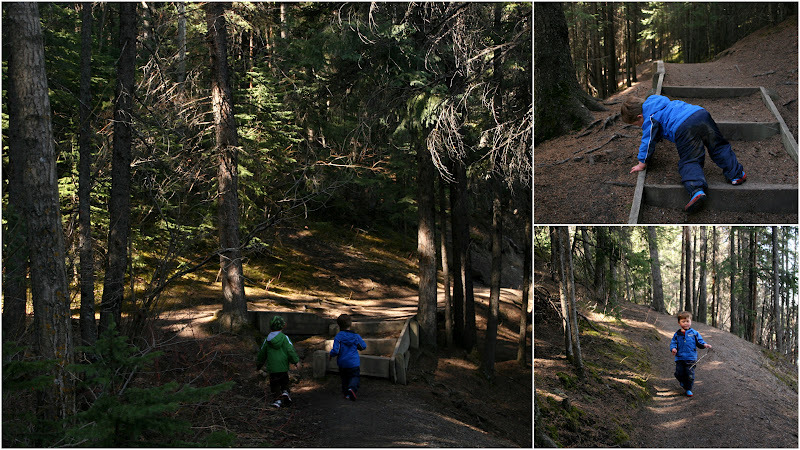 We did the douglas fir trail today and we all loved it. Even the youngest did all the climbing himself. Tomorrow we will try another park. 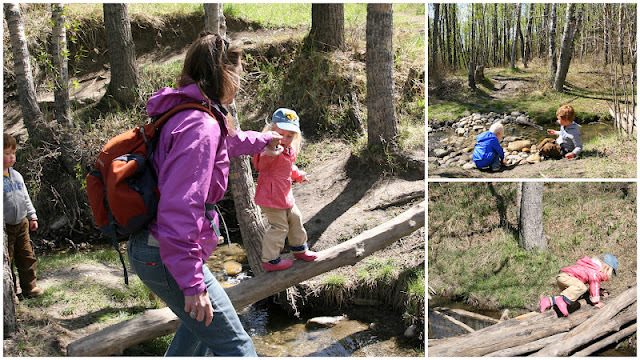 It's good to know which trails are childfriendly, especially since we don't know the area. So thank you! so glad to hear that you had a good hike today. Also glad to hear that the Douglas Fir trail was open and in good shape. Sometimes it's still slippery this time of year. Have a good day tomorrow. This is amazing! I loved every single post on your blog. I lived in Calgary for one year and therefore, I had the chance to visit some of the places listed above. Hopefully, I will be able to visit new ones when I come back! Thanks!! Awesome! I should try every each of them and see what I like the best. I've only been to Edworty Park since it's the closest but I still like going there for a good-one-hour-or-so hiking. I'll first try those two trails at the Glenmore Park next week. Thanks. Thanks ^_^ I have a lot of work to do on getting more hikes up here.